1) With your Chain Nose and Round Nose Pliers, open both of the Oval Jump Rings, and attach one of the charms to each of these. 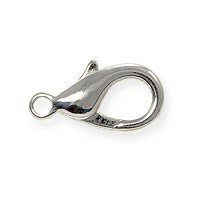 Before closing the Oval Jump Rings, make sure to attach them to the Hammered Oval Link. 2) Take one of the 10" lengths of Beading Wire and thread on one Crimp Tube and the Lobster Claw Clasp. Take the wire around and back through the Crimp Tube. Pull so that the Crimp Tube cinches up to the connector loop on the Lobster Claw Clasp. Leave it fairly loose, as you'll be attaching a Crimp Cover in the next step, and this will cover some of the space between the Crimp Tube and the clasp. Crimp the tube closed with your Crimping Pliers and cut away any excess wire with your Side Cutters. * Repeat this step once before continuing with the beadwork pattern. 4) Thread on one 10mm Aquamarine Bead, one 2.5mm Round Bead, one 10mm Aquamarine Bead and another Crimp Tube. Take the wire around the same Hammered Oval Link that the charms are attached to, and then back down through the Crimp Tube. Pull the wire so that the Crimp Tube cinches closer to the Hammered Oval Ring (not too tight though, the crimp cover needs to have room to fit). Crimp the Tube with your Crimping Pliers, and cut any excess wire with your Side Cutters. 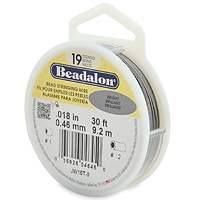 5) Repeat steps #2 through #4 to attach the other length of beading wire. 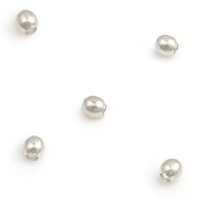 ** Special Note - If you're having trouble attaching the Lobster clasp to the Hammered Oval so that you can wear the bracelet, consider item #JW105 - the Jewelry Wand. This great little tool helps out by holding the clasp lever back so that you can fit it around the Hammered Oval (or any connector for that matter)! 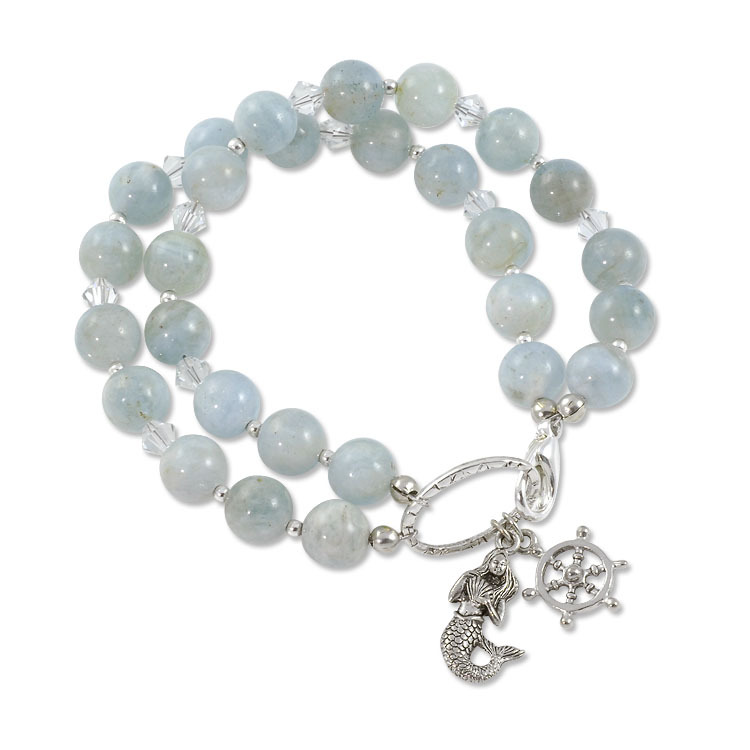 Q: You list all the supplies to make this bracelet except the main bead --10mm aquamarine Do you even sell these beads? I could not find them on your website. 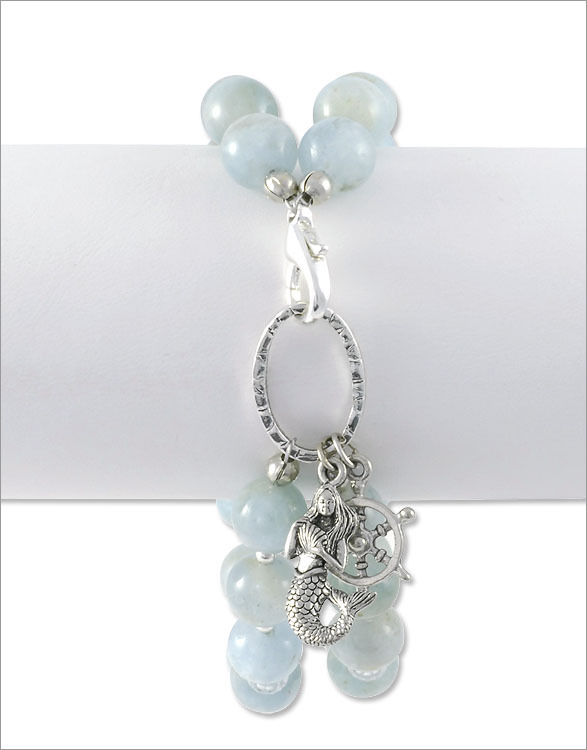 A: Unfortunately, these Aquamarine Beads are currently out of stock.